Home News Telecoms Smart LTE now live in 10 cities around the Metro Manila! Smart LTE now live in 10 cities around the Metro Manila! Wireless leader Smart Communications, Inc. (Smart) has made its Long Term Evolution (LTE) mobile broadband service available in more cities across Metro Manila. According to Smart Broadband Internet and Data Services Head Lloyd Manaloto, Smart LTE is now accessible in more areas in North, Central, and South Metro Manila --among them SM Southmall in Las Piñas, Greenhills Shopping Center in San Juan, UP Diliman, Ateneo De Manila, Miriam College, Sikatuna Village, and the Eastwood Mall in Quezon City. “Smart LTE lets you enjoy the fastest 4G connection all over the Metro Manila area,” said Manaloto. “With 10 cities now powered by our super-charged broadband service, we have more than doubled our coverage since the commercial launch less than 2 months ago,” he added. Other cities with LTE connectivity are Makati, Taguig, Mandaluyong, Pasig, Pasay, Muntinlupa, and Manila. 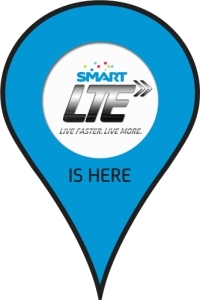 In line with the improved coverage, Smart has continued to distribute even more LTE "sticker pins" in various establishments around Metro Manila to serve as a visible guide to subscribers using LTE. To date, over 150 public places such as restaurants, hangouts, and retail shops sport the Smart LTE sticker pin. Included in the list are Chowking and Greenwich Pizza in Market! Market! Fort Bonifacio, Ling Nam, Subway, Mister Donut, Las Paellas, Teriyaki Boy, and Las Paellas in Greenhills Shopping Center, Dairy Queen and Milk & Tea Station, Cello’s Donuts, Nail It, Kebabers, and Gino’s Brick Oven Pizza along Katipunan Ave. Quezon City, Moonleaf, Delish, Fresh Selection, and Chill Out in Teacher’s Village Quezon City, Seafood Island and Reyes Barbecue at the UP Technohub Quezon City, Puregold and Shopwise along Commonwealth Ave. Quezon City, Yellow Cab and Serenitea at Eastwood City Walk Quezon City, Ang Mo Kio and Arya Persian Restaurant at the Podium in Ortigas, Yoshinoya, The White Hat, and Jammin’ Jamaica at the SM Mall of Asia in Pasay City, and Seafood Island, Tokyo Café, Giligan’s, and Black Canyon Café at SM Southmall Las Piñas. Manaloto adds that apart from letting people know of LTE’s presence, the pins will also help bring in additional business to partner merchants. “It’s no different from having a credit card logo on your door,” said Manaloto. “Smart LTE essentially becomes a value-added service—one that is virtually of no cost to the proprietor,” he added. Dubbed the fastest wireless technology in the world today, LTE is capable of download speeds which are several times faster than present-day 3G and HSPA+ standards. Smart LTE is available in Plans 3500 and 1749 which both come with a free USB dongle and unlimited surfing until January 31, 2012. Subscribers can also upgrade to the Smart LTE Pocket WiFi device for a one-time fee of P2,000. Smart is one of the first in the world to offer commercial LTE, joining the ranks of Japan, Korea, Hong Kong, Australia and Singapore, and the only one to use LTE in three bands.